The deployment of renewable energy technologies means that power increasingly comes from multiple, intermittent sources. This makes it challenging for the network operators to balance supply with demand. Inefficiencies in energy supply lead to volatile energy prices for customers and higher greenhouse gas emissions. A UK company, Upside Energy, has developed a cloud based smart-grid technology that eases peak-time pressure by connecting a range of common devices that store energy. Upside Energy’s platform aggregates the energy stored in everyday connected devices, such as batteries and hot water tanks, to create a virtual energy store that can be drawn on as needed. Devices in homes and small businesses can then be quickly switched on or off at the right times, communicating through the Internet of Things. Upside Energy developed a pilot through a collaborative project, with funding from Innovate UK, and partners including Sharp Laboratories of Europe, Select Innovations (enLight), Tempus Energy and the University of Manchester. 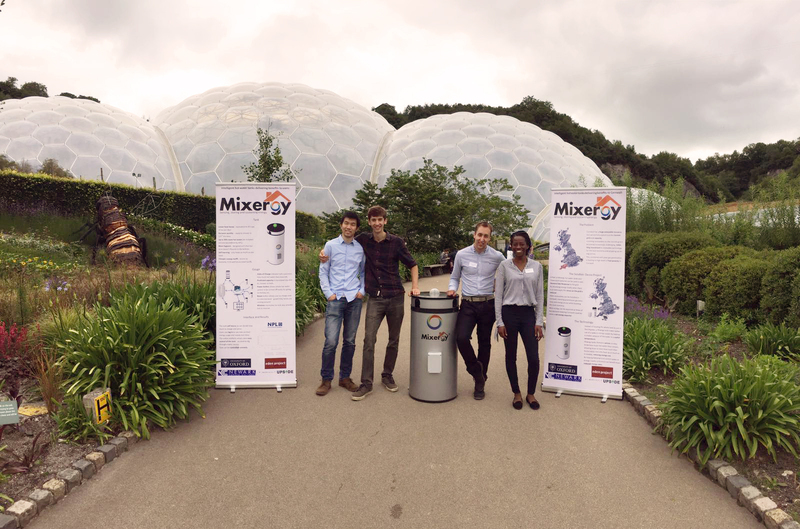 In 2017 the UK government and Innovate UK awarded £2.5m to a consortium led by Upside Energy,with Powervault, Mixergy, Eden Project and Oxford University, for the Pete Project. The project is developing an integrated system using home battery systems, intelligent hot water tanks, and cloud-based Demand Side Response Services to provide a balancing service to the power industry. When there is too much power, the batteries and hot water tanks will charge/heat; when there is too little, the batteries can provide power to the grid and the hot water tanks will stop heating. The project expects to install 500 intelligent hot water tanks and 100 lithium-ion batteries in households across England. Through the aggregation of domestic storage devices, Upside Energy estimates that the Pete Project will be able to offer 1MW of power to the grid. This type of integrated, low-cost system, in a physical and digital network, would provide the flexibility needed to efficiently integrate renewable energy supplies into the grid, helping network operators to balance electricity supply and demand. Customers could also save on their energy costs, avoiding using electricity during peak times.